The kids here are dressed outrageous and are here in droves to catch glimpses of everyone from Migos to Janelle Monáe to Big Sean to Meek Mill to Nicki Minaj. And I, of course, show up with five dresses that all look like I’m going to the bougiest garden party in Martha’s Vineyard. You can take the girl out of the bougie garden party, but you can’t take the bougie garden party out of the girl. Welcome to a special, BET Awards edition of Antisocial, the society column for people afraid of society. 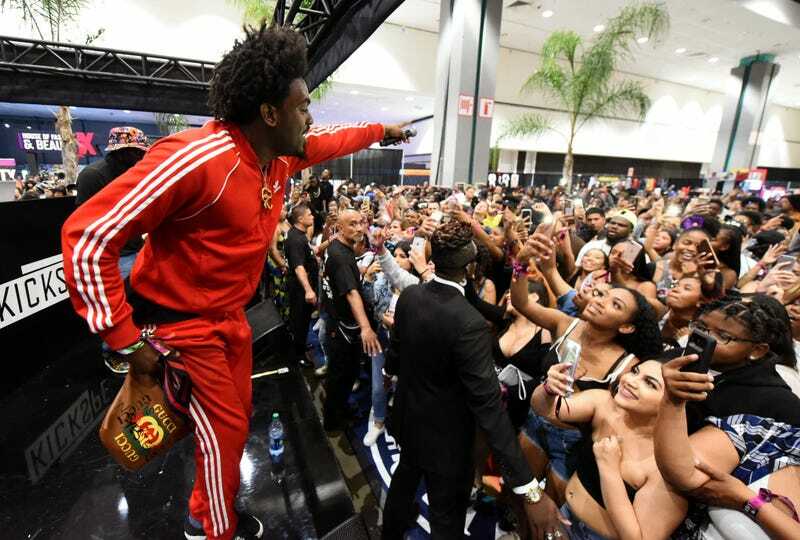 Every year BET tries to outdo itself with its annual awards-show event (and its larger BET Experience festival series, which unfolds over several days leading up to the event), and for the second year in a row, The Root is here for it. I had aspirations of dressing cool for this year’s awards, hosted by Jamie Foxx, honoring the best and blackest in music, TV, film and sports. I ordered trendy jumpsuits that I need to send back because they don’t fit. I bought cool sneakers that did fit. I went with a rose-gold palette. I considered wearing a cool wax print again, as I did last year, until I learned that the theme for the 2018 awards was “Welcome to Blackanda,” and couldn’t stop laughing. Not wanting to be “on brand,” with this Coming to America-meets-Black Panther mashup, I went with a pink, embroidered dress from ASOS that would look great if I were going to get tipsy at a posh, rooftop day party in Washington, D.C.
Whatever. I’m wearing it. I’m taking pictures. It’ll be fine. Why is Chris Brown up for a Director of the Year award against—Ava DuVernay and Director X? Who the hell is the front-runner in this heavily stacked Best Actress category with Tiffany Haddish, Lupita Nyong’o, Issa Rae, Angela Bassett, Letitia Wright and Taraji P. Henson? That said, Deputy Managing Editor Yesha Callahan, video producer Felice León, weekend Social Media Editor Corey Townsend and I somehow all managed to get here to cover this thing. We’ll be live-blogging, live-tweeting and Instagramming everything, so please, follow along at our respective accounts. I promise I’ll try to not be wack if I can’t be cool. Honest to goodness, I will try.